Eichhornia crassipes (E. crassipes), more commonly known as water hyacinth, is often considered to be the world’s worst aquatic weed. 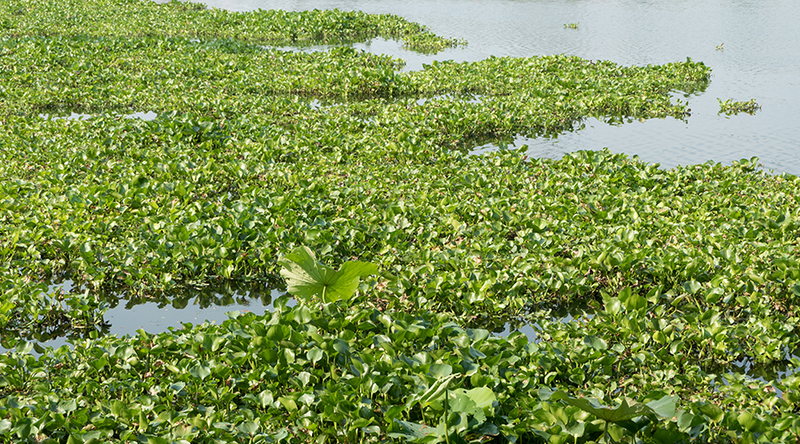 According to the Agricultural Research Council (ARC): it has gained its reputation as such due to its “invasive potential, negative impact on aquatic ecosystems, and the cost it necessitates to control it.” The water hyacinth can be classified as a herbaceous, free-floating aquatic plant that produces attractive lilac flowers and has submerged roots and doubles every 11 to 18 days. Once the water hyacinth has grown sufficiently, it is able to entangle its petioles (the spongy, bulbous part of the plant) with other water hyacinths around it. By doing so, they are able to form a dense ‘mat’ which has the ability to cover the entire surfaces of dams, slow-moving rivers, or areas of water with very little movement. Water hyacinth was first documented in South Africa in the early 1900s in the Cape Flats and has since spread countrywide as South Africa’s eutrophic (mineral & nutrient rich) water bodies and temperate climate make for the ideal environment for the aquatic weed to spread and thrive. Hartebeespoort dam, which lies north of Johannesburg, Gauteng, has become an unfortunate example of water hyacinth’s invasive capabilities and its resilience. The vast majority of Hartebeespoort dam’s surface can now be mistaken for a lush green field in that the water hyacinth has multiplied and is so dense that it no longer resembles the dam that is once was. In April 2017, it was estimated that just over 30% of the dam’s surface was covered by the plant. Water hyacinth is known to be a domineering force in any environment; the negative effects of a water hyacinth invasion are both environmental and economic. Water hyacinth infestations are associated with the decline and degradation of the local aquatic biomes, the restriction of water flow as well as the potential health risk imposed by infested bodies of water that are utilised in order to provide communities with a daily source of water, which is currently the main concern. The Hartebeespoort dam, a well-known resort town, has had to put the majority of its recreational water sports and activities on hold due to the prevalence of water hyacinth. The South African E. crassipes (water hyacinth) “has been declared a category 1b weed in terms of the National Environmental Management: Biodiversity Act (10/2004): Alien and Invasive Species Regulations, 2014, which necessitates its control or eradication where possible” (ARC), but it appears that this is easier said than done. In terms of removal techniques, there are multiple methods available including the physical removal of the plants, herbicides, the release of biological agents, or the re-appropriation of the plant for subsistence or commercial purposes. Most of these methods are largely ineffective when used in isolation. However, the most potentially effective method of control and eradication is by deploying biological agents, including the use of two different insects. The Hartebeespoort water hyacinth crisis is now not only an environmentally contentious issue but also indicative of the discord between the Department of Water and Sanitation, the Department of Environmental Affairs and the Hartebeespoort community and the way in which the crisis has been managed so far. At this stage, the use of herbicides isn’t on the cards, but with peak tourist season soon approaching and the dam disappearing, something needs to be done, and soon.